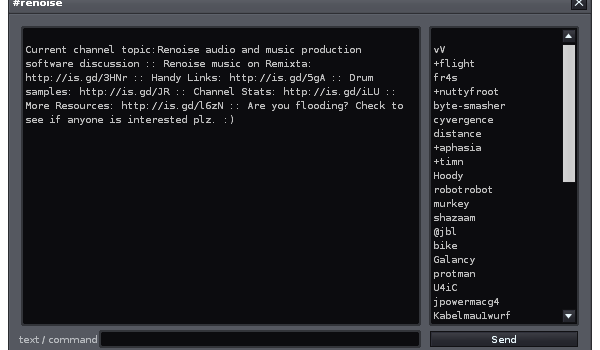 Simple IRC client that allows you to chat from within Renoise. By default logs right onto the #Renoise chat channel for you on the correct server. For generic chat, community support or co-op productions, meet with fellow Renoise users online! The client can be started from the "Help -> Visit the community chatroom"
Do note there is a custom assignable shortcut option in the Global -> Tools area to hide/show the IRC chat-dialog! -Simplified input options which should also resolve the cumbersome non-clearing line issue. just start typing to get any text on the line. backspace = remove last character. del = remove whole line. -Updated keyboard routines to respond to input again. - Fixed error when logging on to the server hitting "enter" on the login dialog. - Experimental hide mode added (answering the minimize request): Extra shortcut to reopen the chat dialog in Globals -> Tools -> ~Show/Hide IRC Chat, use ctrl+alt+c to hide from within the tool. - Fixed bug where empty chatlines were spewed in the chat-frame.